A perfect, lush, green lawn is something that countless homeowners hope to achieve. But as modest as this goal may seem, don’t be fooled into thinking that it is easily obtained. If you’ve spent at least some Saturday mornings mowing and watering your lawn, you’ll know that a perfect lawn is actually a hard task. After all, the sun and the rain, key players in the grass-growing equation, are also major contributors to the appearance of lawn-damaging weeds, fungi and voracious bugs. So how do homeowners strike the perfect balance that leads to an impeccable lawn? You’ll need patience, dedication, lots of water as well as top-notch fertilizers, topsoil, and mulch (oh, and some friendly weather is always welcome). We’ve gathered the best information and lawn care tips to make sure that you can proudly show off your green lawn all year round. This is the Ultimate Guide to Lawn Care. Even though we’ve focused on climate zones, be mindful of the fact that it is not the only element that should be taken into account when choosing the type of grass that you want to plant. We’ve all heard of the term microclimate and though seemingly unimportant, your own yard may have one of its own. Because of the presence of certain large objects (i.e. 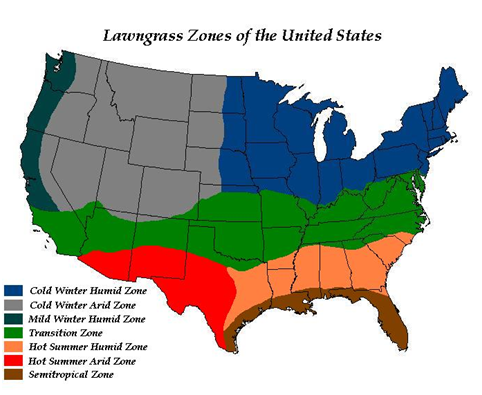 your home, large trees, pavement, bodies of water), microclimates differ from your zone’s general climate. These subtle changes are extremely important for a number of reasons. On the one hand, you have the sun, which shines differently (and in different areas) throughout the course of a day. But while some grasses adapt to these minor changes, other don’t, so it’s a good idea to foresee such limitations and use different grass varieties. Shade: lawn grass has a hard time if it doesn’t receive enough sunlight (>4 hours/day), so plant shade-tolerant grasses in those areas of the lawn that are in the shade (St. Augustine, for instance, or fescue). Intense Sunlight: it can cause grass to dry out faster, so you’ll need to compensate by watering the areas more frequently. Heat: pavement stones, driveways, patios, walkways and other regions of your house store heat and radiate it into neighboring lawn areas. Be mindful of watering these areas more frequently. South-facing slopes: grass tends to dry-out if it’s found on slopes because of the fact that water drains faster. Frequent watering is of utmost importance. Soil: You may be surprised to find that you have differing soil types around your house. Ideally, you should strive to have native topsoils, since subsoils are harsher on grasses. Characteristics: coarse, tough, deep and extensive roots, helps stabilize erosion-prone soil, shade-tolerant, semi drought-tolerant, does well in sandy/infertile soils. Bahia grass is durable and has excellent wearability. Mowing concerns: a high-maintenance grass, requires frequent mowing, use sharp blades. Characteristics: Common Bermuda grass is medium- or fine-textured, has deep roots, it spreads quickly, is drought-tolerant, heat-tolerant, does well in poor soils. Because it spreads rapidly, it needs to be kept in check. Hybrid Bermuda grasses have a finer texture, are denser, greener and softer than their common counterparts. They also are fast-growing, drought-tolerant and durable. Common Bermuda grass may turn brown in winter if daytime temperatures don’t go over 60 degrees Fahrenheit. Hybrid Bermuda grasses are an excellent choice for lawns that get a lot of traffic. Mowing concerns: Bermuda grasses don’t present any mowing difficulties. Characteristics: Quick-growing, coarse- to medium-textured, deep-rooted, broad-leaved, rapidly-spreading, dense, thick, heat-tolerant, sun-, shade- and salt-tolerant. St. Augustine grass is beloved in southern climates because of its high tolerance to heat. Mowing & other concerns: Though St. Augustine grass can thrive in most soils, it prefers well-fertilized, alkaline soils. The one thing that this particular grass type is susceptible to is brown patches. This, in turn, causes it to have a high risk of developing chinch bugs, sod webworms and mole crickets, as well as St. Augustine Decline virus. Characteristics: medium- to fine-texture, light-green color, uses creeping stolons to spread, shallow roots, moderately drought-tolerant, slow to fill-in, unfit for wear-and-tear, not suitable for high-traffic areas, disease-resistant, pest-resistant, low-maintenance. Centipede grass turns brown in dry, warm weather. It also goes dormant in winter. Mowing & other concerns: Centipede grass doesn’t tolerate sea spray salt. If it turns yellow, it may be a sign that the soil is alkaline and lacks iron. Solve this issue by adding iron chelate and sulphate. Characteristics: fine- to medium-textured, deep-rooted, dark-green colored, not suitable for barefoot traffic, low-maintenance, can withstand high-traffic. Zoysias have the added bonus of being pest- and disease-resistant as opposed to other warm-season grasses, but low-maintenance doesn’t mean no-maintenance, and neglecting zoysias may result in unwanted surprises. Mowing & other concerns: Fairly simple to mow and care for. These particular types are fairly low-maintenance and are considered the environmentally conscious decision. Blue grama and buffalo grass are the two most common native grasses. They both are drought-tolerant and thrive in low-humidity regions. Buffalo grass is particularly expensive to plant, though. There are four main types of cold-season grasses to choose from, and the decision is based both on climate and that which you most value in a lawn. Characteristics: fine-textured, forms a tight turf, high-maintenance, suitable for low mowing (Creeping bent grass) or suitable for cool, humid areas, not so high-maintenance (colonial bent grass). Normally, bent grasses have shallow roots and require careful fertilizing and frequent watering. Mowing & other concerns: Bent grass is prone to diseases such as gray snow mold, pink gray mold, dollar spot red thread as well as brown- and summer patch. Characteristics: Four different types of fescue families with fine, bristle leaves, deep roots and a lush, green color. Chewing fescue, red fescue, hard fescue and tall fescue are virtually indistinguishable to the untrained eye. While chewing fescue is exceptionally shade, cold and drought-tolerant, red fescue is only shade and cold-tolerant (much more so than other representatives of the same family). Tall fescue, on the other hand, is particularly dense and boasts roots that are 3-feet-deep. It’s excellent for high-traffic areas and often mixed with Kentucky bluegrass. Hard fescue is slow-growing, fine-bladed and doesn’t have such deep roots as other fescues. It, too, can be mixed with bluegrasses and ryes and has a high drought- and shade tolerance. Where heat tolerance is concerned, hard fescue is the most heat-tolerant of all fescues, so if you want a lawn that stays green over the summer, this is clearly a good contender. Mowing & other concerns: Red fescues have a hard time growing in wet soils, clay, or when the soil has an excess of nitrogen. You should also bear in mind that fungal diseases are common. Characteristics: With over 200 different bluegrass types, it’s difficult to choose one that reigns supreme. Even so, Kentucky bluegrass is a worthy mention, with a moderate tolerance for wear and tear, weak shade tolerance and drought tolerance. Where Kentucky bluegrasses excel is at tolerating cold temperatures. Characteristics: While annual ryegrasses are fast-growing, coarse-bladed, medium green and shallow-rooted grasses, perennial ones are fine-textured, glossy-bladed, deep-green and have shallow root systems. If you plan on a high-traffic lawn, perennial ryegrass is what you should focus on getting, since annual ryegrasses are only suitable for moderate traffic. If you live in cool-season areas, perennial ryegrasses are excellent. Mowing & other concerns: Annual ryegrasses are not tolerant to shade, drought, heat or cold. It’s important to plan just how you want the lawn area to be levelled. Of course, you’ll think about the appearance of the lawn itself, but aside from this, a properly levelled lawn will help preserve the foundation of your home. Ideally, a lawn needs to gradually slope away from the house so that rainfall drains away from and not towards the foundation. Quick tip: There are certain tasks which are better handled by professionals. Getting your lawn area is one of them. Of course, if you live in flat parts of the US, you may succeed in accomplishing this task yourself, however, other areas with sloping ground may require the attention of a contractor or a landscape architect. As a general rule of thumb, the ground surrounding your house should slope away approximately a quarter of an inch for every foot. Simply put, for a 100 foot-long yard, the ground should be at least 2 feet lower at the edge of your property as it is at the base of your home. Yard levelling can be done by professionals and depending on the difficulty of the job, can cost anywhere between £400 (if minor work is necessary) to several thousands of pounds for an entire residential property (read more about levelling here). You can grade the lawn yourself if the ground is relatively level and has no large impediments (such as massive rocks, boulders or tree stumps). Now that you’ve prepared for this job, consider the following: you’ll need to know exactly how long it takes for water to drain from your house when it rains. This question is particularly important because if it takes too long, you may need to consider installing a drainage system. Then, the hard part begins: you’ll simply have to move soil from higher spots of your lawn area to lower spots until the entire lawn slopes gently away from the foundation of your house. In order to check your progress, you wooden stakes (3-4 feet long) which you drive into the soil at the base of the home and at a distance of 100 feet away from your house. If you tie a string between the two stakes, you can measure the drop between the two. There are also situations when frost may cause damage or lifts under the turf, in which case you’ll have to do minor levelling work. Fertilization is a necessary element of your lawn maintenance schedule, but feeding your lawn isn’t such an easy task. Proper lawn treatment involves a multitude of fertilizers, particularly in early spring, when most grass types begin to green up. Of course, your choice in fertilizer will depend on the climate, grass type you plan on laying and results you hope for. Aside from spring fertilization, fall fertilization may also prove appropriate. Yard maintenance and lawn care doesn’t just revolve around thatching, aerating, watering and mowing your lawn. So you’ll need to understand the basics of fertilization, including the macro- and micro-nutrients that plants benefit from. Grass, for instance, will require an increment of macro-nutrients in order to thrive. These macro-nutrients are N-P-K (nitrogen, phosphorus and potassium). While nitrogen is involved in proper foliar growth and colour, phosphorus encourages root growth and early establishment, while potassium promotes a plant’s capabilities of nitrogen usage. Soil test kits are excellent at showing you which particular nutrient is deficient. Fast-release fertilizers: They yield fast results but must be applied in small portions, at frequent intervals. Take care to not burn your lawn by applying too much fast-release fertilizer. Slow-release fertilizers: they are used sparingly and generally cost more than other types of fertilizers. Weed and feed: a combination of herbicide and fertilizer, designed to destroy unwanted weeds while feeding the grass. The issue is identifying the weeds before application and caring for shrubs, flowers, garden plants and trees. Organic fertilizers: compost and manure contain essential nutrients, however, as opposed to everyday fertilizers, you’ll need massive amounts of organic fertilizers to obtain satisfactory results. Quick tip: There are alternative types of fertilizer, including coffee grounds (they contain phosphorus, nitrogen and trace minerals) and homemade fertilizers (as strange as it may seem, beer, soda, ammonia, and other household items are great ingredients, as you can see in this article). Liquid fertilizers: they must be applied frequently (application is difficult) and are rarely used. Any fertilizer will have instructions on its label as to the feeding schedule, so following those guidelines will represent the best guide on how to apply the fertilizer and how much. Tips on using fertilizer: Be sure to properly water the lawn during the days before fertilization, but ensure that the grass blades are completely dry when applying the substance, so that you avoid burns. Though each person prefers to apply fertilizer differently, a good idea is to use a spreader, so as to ensure maximum coverage. As opposed to hand-fertilizing, a spreader won’t cause burns or pale areas (due to high respectively low fertilizer quantities). Also, be sure to correctly cover your lawn by making fertilizer trips over the lawn at correct angles: ideally, start in a north to south direction and make the second trip from east to west. Yes, there’s no doubt that starting a new lawn is a difficult task. Yet, despite this, it’s an extremely enjoyable and rewarding experience. Of course, you can have a lawn care business or a company providing lawn care services cater to this part, however, you’ll find that you can save money and successfully seed a new lawn with a bit of patience and hard work. Before starting to lay the sod, you’ll need to apply fertilizer rich in phosphorous. Then, use water to make the entirelayingarea moist. You’ll want to work in the opposite direction of the yard slope. Of course, many of us want to know how much sod costs, and while prices may differ on grass type and quantities, you’ll find that the price ranges between £1.75 and £5 per square metre, depending on quality and delivery costs. Pro tip: Ask that yoursodbe delivered right before you startlaying it and store it in a shaded area. That’s becausesod can quickly go bad, especially if it stays in the sun and dries out. An alternative is to unroll the sod and strive to keep it moist until it can be placed. After having fertilized and watered your lawn area, you’ll want to prepare the soil by using a roller, so that the soil becomes so compact that your footsteps leave a dent no deeper than half an inch. Slightly water the area and prepare the sod, which is supposed to be laid one section at a time. The best approach is to use the full strips alongside the edges of your lawn or next to the sidewalk. Make your way to the edge of your house and once you’ve exhausted the full strips, proceed tocuttingand fitting as needed. You’ll need a sharpened trowel to fit sod at joints or to level off soil irregularities that may present themselves. Pro tip: Avoid overlapping but make sure that all joints are as snug as possible. Also, make sure to use full strips at the perimeter of your lawn area, as these portions are prone to drying out. Once you’ve installed several sod pieces, water generously so that the sod is completely soaked. Feel free to use rollers if air pockets form under the sod and fill exposed joints between sod strips with fine soil. Contoured borders are a bit trickier, but with patience and some trimming talent, you’ll surely succeed. 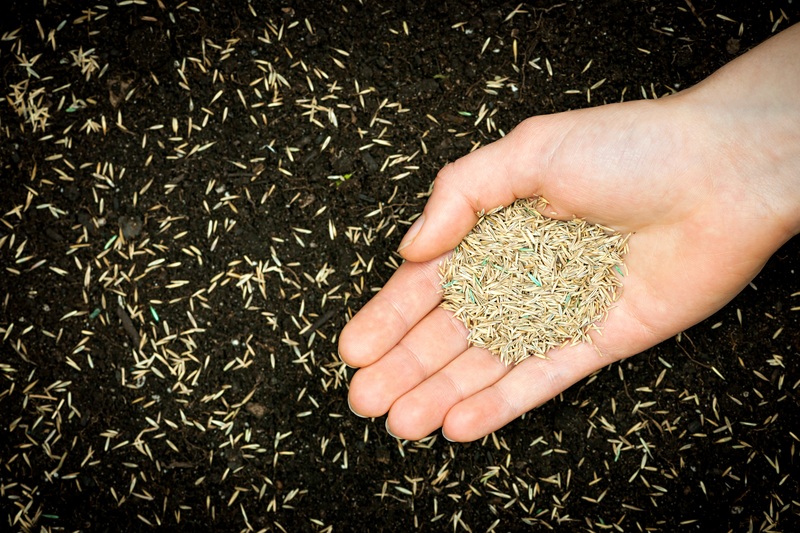 With quality grass seeds that thrive in your area, seeding lawn from scratch shouldn’t be as difficult as it’s often made out to be. Though testing your soil is recommendable, it’s not a mandatory step, so you can begin by preparing the soil and inspecting the ground. By this time, you will have already removed debris and large rocks, so that you can start breaking down the soil with the tiller. Ideally, your soil should be broken down into particles no larger than pea- or marble-size. Even out the surface as best you can with the help of a rake and proceed to fertilizing and seeding the ground. Of course, by this time, you’ll be wondering whether it’s best to fertilize first and plant the seeds later or the other way around. In all honesty, since you’re doing everything the same day, it’s really not as important, especially when you use a rotary spreader. Lay down the seeds and fertilizer and cover them up with a ¼ inch of dirt. Watering is the next step, and mind you, the desired goal is to always keep your new lawn moist. At this time, you may have to water your lawn 2-3 times per day until your seedlings are clearly established. That’s when you’ll cut back to once or twice per week. Planting sprigs can be done in two different ways: you can either stolonize or use furrows. If you choose to stolonize, sprigs are laid out over the soil at a rate of 5-10 bushels for every thousand square feet. The bushels are then covered with half an inch of soil and pressed into the soil by rolling. When you plant the sprigs in furrows, you’ll need to keep the grass variety in mind when considering spacing. They can be planted 1-2 inches deep and up to 12 inches apart, depending on the producer’s recommendations. Either way, after they’ve been covered with soil, make sure that at least one portion is exposed to sunlight. Similar to planting sprigs, you’ll want to plant plugs inside shallow furrows or holes that are set out 6 to 12 inches apart, depending on the manufacturer’s recommendations. These recommendations are generally based on the spreading speed of the type of grass you’ve chosen. ü Watering is best done in the early morning, when the weather is cool, humidity is high and evaporation is kept to a minimum. ü If you live in areas where summers are warm and dry, strive for at least 1-2 inches of water/week, ideally in two different applications. ü Never water your lawn more than three times/week. ü Be mindful of water penetration: ideally, you want to have water penetrating to approximately 6 to 8 inches deep. Pro tip: You can always test how deep moisture penetrates by using a screwdriver or a metal rod. The instrument will move easily through wet soil, but come to a stop once it encounters dry soil. It’s also very important to be able to recognize a stressed lawn. It generally has a distinguishing bluish-green tint, is slightly wilted and will bear your footprints (or the tracks of your lawnmower) for more than 30 minutes. Pro tip: Don’t misjudge the situation: even when the weather is hot and dry, the soil may remain moist, so it’s best to test it before irrigating. 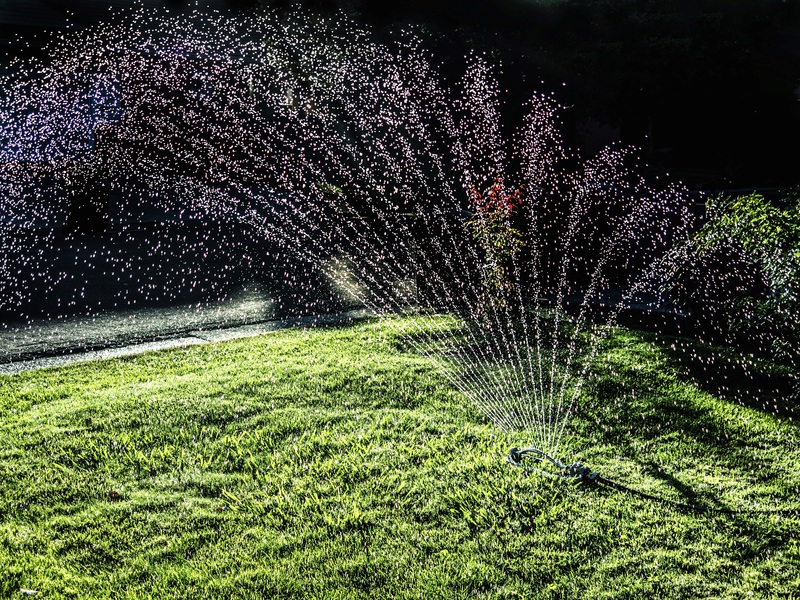 While some people enjoy the time they spend watering their lawn, other see it as an unwanted chore, in which case, an irrigation system may be what you need. Here’s a great guide on choosing an efficient lawn sprinkler system. You either love or hate mowing your lawn, but even if it isn’t the first activity that springs to mind for a Saturday afternoon, it contributes to the overall health of your lawn. Much like other plants, if you clip off their growing points, you’ll end up with a denser turf. The question, though, is how often you should mow your lawn and whether you should do so at specific heights. Pro tip: Only mow your lawn when the grass is dry, so that diseases don’t spread around your damp turf. Furthermore, damp grass may end up clogging your precious lawnmower. While there isn’t any guideline as to the frequency of mowing, most lawns require weekly mowing, especially during spring and summer. You’ll need to set your mower to specific heights for each mowing. Consider the following guidelines (in accordance to the grass you’ve chosen to plant). Don’t be afraid to use grass clippings as the valuable organic materials that they are. You should not fear leaving the grass clippings on the lawn if they’re no longer than 1/3 of the grass blade. If they’re longer, feel free to use a leaf rake and remove the clippings. Read more about lawn mowing here. Pro tip: Always mow in opposing directions to promote upright growth. If there’s something that your perfect lawn doesn’t need, it’s weeds. Or does it? There’s no denying that common weeds, such as clovers and dandelions, are magnets for butterflies and caterpillars. Moreover, weeds attract beneficial bugs that take care of both pollination and exterminating “bad” bug populations. But even so, we rarely like a weedy lawn, so let’s take a look at common lawn weeds and how to deal with them. Normally, you’d be able to identify common weeds, although they may not be as evident to the untrained eye. This great resource extensively discusses garden weeds and how to recognize them. Soil types also provide valuable cues in the sense that weeds may actually show you what nutrients your soil is lacking. Clover, for instance, thrives in soils with minute levels of nitrogen, so applying fertilizer may solve the issue. Soil that is infertile generally houses weeds such as yarrow, ragweed, clover, thistle, dandelion, plantain, mullein, crabgrass or sorrel. Fertile soil, on the other hand, is preferred by weeds such as chickweed, chicory, horehound, foxtail or lambsquarter. Excess moisture leads to the appearance of weeds (aside from other issues) such as: bindweed, moss, knotweed, spotted spurge, sedge, bluegrass, violet or ground ivy. Excess dryness, in turn, causes the appearance of mustard weed, yarrow, Russian thistle, carpetweed and speedwell. Quick tip: Pulling the weeds out does little to help the problem, since the roots break and serve as starting points for new weeds. Ideally, choose a weed control product that’s especially designed to deal with your problem. Using herbicides for lawn care and weeding is a two-edged sword, since these products may end up killing both desirable plants and weeds. Remember that aside from the grass, you still have trees and flowers, shrubs and other decorative plants that you need to be mindful of. Ensure that your sprayer is properly calibrated, don’t spray on windy days and always follow the instructions of the product you’re using. Acidic and alkaline soils come with their own weeds: the former is generally populated by moss, hawkweed, sorrel and plantain, while the latter often houses chickweed, chicory, Queen Anne’s lace and spotted spurge. Fungi are the most common cause of lawn diseases, but in order to appear, they require specific conditions. They need a specific plant to infect, the right temperature, aeration, and moisture conditions. Moreover, they need their spores to be able to infect nearby grass. Grass: When outside its normal adaptation range, any grass may be subject to fungal disease. That’s because of impaired growth. But there are situations when perfectly chosen grass types, planted in the right climate, may become infected. One solution is overseeding. When incorporating less susceptible grass types with your lawn, you effectively protect the more susceptible grass. Moisture: As you may have expected, overwatering is an issue and excess moisture is one of the driving factors of fungal diseases. So make sure to never keep your lawn constantly wet. Infrequent watering ensures that your lawn has the time it requires to dry out, thus preventing fungal diseases. Mowing: A stressed lawn is susceptible to diseases and mowing low creates exactly such conditions. Additionally, fungi can spread spores via the mower blades. Temperature: Beware of troublesome combinations, such as warm climates and non-heat-loving grasses or cool climates and heat-loving grasses. Fertilizing: Surprisingly, some fungi prefer well-fertilized lawns while others prefer under-fertilized ones. So test your soil regularly and always use fertilizers in accordance to their instructions. Thatch: The excess moisture that thatch holds is an idea breeding ground for fungi. That’s why aerating and power raking are things to consider when caring for your lawn. There are many lawn pests that may end up destroying your prized grass: armyworms, cutworms, billbugs, chinch bugs, greenbugs, sod webworms, white grubs, ants, leatherjackets, worm casts and moles are just some. While maintaining a healthy lawn is the one common preventive measure, you may find yourself having to deal with each of these problems individually if they appear. It’s recommendable to ask for professional help and find a company that offers lawn care services (including pest control). Proper aeration, thatch control and improved water penetration help prevent such issues. Pesticides: Certain chemicals cause imbalances in your lawn and, in the process, kill beneficial organisms that protect your lawn. This may result in an even thicker layer of thatch to worry about. No lawn care guide would be complete without some tips and guidelines for lawn care in winter. Of course, lawn maintenance is put on hold during winter and while that may make many homeowners happy, there are still certain things you need to take care of. Fertilizing, for instance, can be done in early winter, especially if your lawn features cool-season grasses. So ensure that your lawn gets a great fertilizing session before the first freeze, so that it’s fed throughout the winter. Gradually mow your lawn shorter to prevent field mice from using it as a warm place to sleep. Since mice and other burrowing animals build nests, they can destroy large parts of your carefully maintained lawn. Also, be sure that your lawn doesn’t suffer excessive traffic during the winter, since it may have a hard recovery time if a path is created during the winter. There are a multitude of aspects you need to take into consideration before setting forth on your lawn care adventure. But if you live in the US, you also have to take climate zones into consideration, since certain grass types are fit for specific climates. North-eastern regions are particularly humid both in winter and in summer. That’s because summers come with heavy rain while winters are cold and snowy. Consequently, cold-season grasses predominate in these regions. Where soils are concerned, the northeast generally has acidic soils and while cold-season grasses are the norm, you may succeed in growing some types of warm season grasses if you live along the coast, where the climate is milder. The Midwest is similar to the northeast in terms of temperatures, both having snowy, harsh winters and humid summers. The Midwest also sees frequent rainfall, so that cold season grasses are what you should be opting for. The Coastal West is known for how much rain it generally sees throughout a year (though in the south, rain is generally common during the winter). As opposed to the humid summers that the northeast and Midwest see, summers are dry here, but even so, soils are acidic so lime is necessary before planting grass. The west also contains some colder, dryer areas, especially in the Great Plains, where the climate is rough and lawn care enthusiasts have a hard time achieving a perfect lawn. That’s because these areas see wide temperature fluctuations, rainfall and high-winds. Your best bet is to go with native grasses commonly found in these areas, such as blue grama, crested wheatgrass or buffalo grass. You can also opt for other cold-season grasses. Where climate is concerned, the Western Transitional Zone generally sees arid, long summers and mild winters. Such temperatures allow you to choose from a plethora of warm- or cool-season grasses, though you should be mindful of water supplies in certain areas and choose accordingly. Also, be sure to overseed your grasses with ryegrass or fescue if you want your lawn to stay green in the winter. We’ll discuss overseeding below. If you live in the southwest (California, New Mexico and Arizona), you’re already aware that the region generally sees prolonged, warm, dry summers. The lack of precipitation means that you will have to choose grasses that are suited for such harsh conditions (zoysia grass and Bermuda grass, to name just a few). Overseeding is another option. Luckily, since the soil is alkaline, you won’t need to use lime. With warmth and sufficient rainfall all year round, the southeast is a great place to experiment with grasses and see what works best. South-eastern soils are acidic, much like those in the Northeast and on the Western Coast. If you do live in cooler areas, consider planting fescue or overseeding warm-season grasses to keep them lush during the winter. Much like in the central southeast, summers are warm and humid, while winters are mild. The particularity about the Eastern Transitional Zone is the fact that it sees temperature variations at higher elevations, where winters tend to get colder. Consequently, you may choose to use warm- or cold-season grasses, but remember that neither is perfectly suited for this region. There are three adjectives that best describe these regions: wet, wet, and wet. Of course, this region is also warm, but with that much rain, it’s important to remember that you’ll have to be mindful of diseases. That’s why you should only focus on warm-season grasses and couple that with carpet grass if and when you encounter wet spots. St. Augustine grass is another great option. Make sure to let us know if we’ve missed some important pieces of information and we’ll make sure to have them featured in the article. We’d love your feedback in the comments section below, so feel free to make your voice heard!